Fast Track by Rajesh Verma has been put together keeping in mind candidates of competitive examinations who intend to compete CSAT, SBI PO/Clerk and IBPS PO/Clerk, LIC AAO, Railway Recruitment Board, CMAT, MAT, State and others. 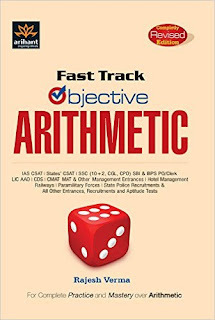 The Best about is this book is that every chapter provided in 2 level for exercise, this is one of the unique things which make a big difference in RS Aggarwal and Fast Track. • This book is divided into 46 chapters and every chapter consists of a greater number of MCQs for practice. • Every question is explained well. • In this book, you also get short tricks to solve questions. • ‘Some Important Facts’ have been provided in between the chapters which will help you to always remember the important points. • Every exercise divided in Two level Basis and Moderate. Arihant is a leading book publisher so they always provide good material according to readers exceptions. So this book also has a good quality material with good binding. Like every book in this book also have some errors remain. So sometimes its puzzle you. This Book is worth buying if you want to check your competition skills for Arithmetic or Quantitative Aptitude. In this book, every topic is covered by the publisher with a good number of MCQs.